The night before taking off on our final day, we decided to humor ourselves and check the weather. Seattle in September is normally pretty pleasant but you can never be too sure. Low and behold heavy rain showers were predicted to come at around noon. We (Josh) decided to wake up at 6am in order to beat the rain for as long as possible. With our ride only being a little over 60 miles, we figured a little rain wouldn’t affect us at all. Boy were we wrong. We packed up our personal stuff as quickly as possible so we could get on the road, leaving the tents and bigger gear for Tony to pack. While packing the car Tony was heckled at by a 12 year old from across the campsite. After hearing, “Hey you, yeah you with the grey gym shorts”, a flawless description of Tony, he turned around to get into a stare down with his newly found nemesis. The silence was broken as the kid proclaimed, “fight me bro” as he broadened his shoulders. Tony, deciding that this wasn’t the time or place to duel a middle schooler, ignored him and continued to pack. As the cyclists began their journey, they were quickly greeted by a light drizzle and a comfortable breeze. The inner Seattleite in us scoffed at the so called “rain” that the weathermen predicted. Slowly but surely that drizzle turned into a torrential downpour with a side of gale force winds sprinkled in, 4 hours before the weatherman predicted. Thanks Obama. Rain jackets soon became useless as it was impossible to even attempt to stay dry and warm. 20 miles into the bike ride it became very evident that this was going to be the worst day in Cycle for Charvat history. One might then ask for consolation, ‘Well, what’s the best possible way to enjoy biking in a mild hurricane?’ We came up with two great answers to that question. Not 5 miles before the Seattle arrival, Cesar thought it’d be a kick in the pants to run over a giant nail and replace his tire on a two-foot wide highway shoulder. He knows how to have a good time. While servicing the tire, Cesar dropped a screw to his bike on the road and could not find it. The high wind speeds coupled with cars spraying us as the drove over puddles made finding the screw and picking it up with numb hands almost impossible. 15 minutes into looking for the screw and amidst our hypothermic spasms, John and David approached us saying, “We just pissed ourselves for warmth, you guys gotta do it.” After Matt and Kyle turned down their tempting offer, they responded with, “Come on, just piss yourself, we did it and it's freaking awesome.” They liked it so much that they did it a second time while biking 30 minutes later. The second method was developed and strenuously tested by our beloved philanthropy chair Luis: A fun little fact about Luis is that he never learned how to change his gear out of granny gear. This meant that he had to peddle at approximately 250 rpms just to maintain a normal speed. Luis was working his body so hard while spinning his legs that the rain actually was converted to steam the second it made contact with his body. Side effects of this tactic may include passing out on the side of the highway, looking like a banshee, and excessive waste of energy, but Luis was more than willing to roll the dice for warmth. We finally made it onto the Ferry back to Seattle and were so cold and wet that we penguin huddled in the bathroom under the one heater that we could find. Once we dried and warmed up enough to where we had the finger dexterity to open a wallet, we bought discount clam chowder worthy of a Michelin Star. We made it to Seattle at around 2pm with soaked jerseys but big smiles. While the ride only lasted 4 days, the men who took part had to challenge themselves in ways they never had before. We all laughed, screamed, and sweat our way through the journey and it is one that none of us will ever forget. We hit our goal of raising over $10,000 for young adults with cancer and absolutely could not have done it without the love and support of all of our followers. After Josh, Nigel, and Matt started Cycle for Charvat in 2016, they hoped that it could become an annual event. After someone broke into Theta Chi and stole all the bikes out of it, the entire house feared that that would be the end of Cycle for Charvat. 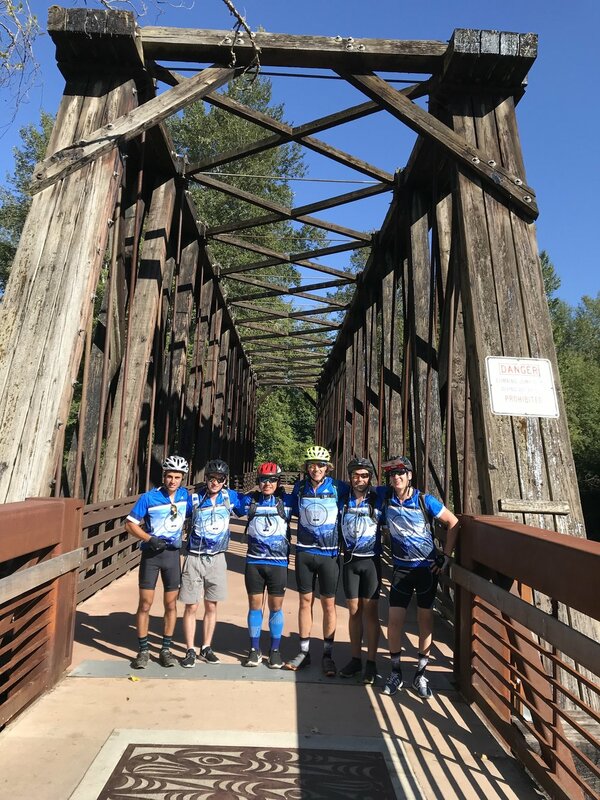 With the leadership and drive from a few strong members in the house, Cycle for Charvat is about to take off on its third annual ride, this time to San Francisco. It has been surreal to watch something that you created grow into such a large annual event that has already raised $40,000 for the Kyle Charvat Foundation. We all look forward to following and supporting the bike ride in the years to come, and we hope you do as well. We kick off the morning bright and early. Mama Bean wasn’t playing around as he shook us all awake at 6 am sharp. We walk out into the brisk morning air to find that all the gear we were too tired to store away was soaked in the morning dew (Eagle Scout Matt’s raingear). We shook it off because it’s Dawg Saturday and if we made it to the campsite early, there were hopes that we could stream the game. We quickly ate, packed up, and departed the South Beach Campground. We catch a series of flat stretches and incredibly smooth road. Josh promised that ride would be ‘mostly flat’ and for the first time we were benefiting from this. We were cruising at a really solid pace when we met up with Tony 20 miles into the ride. John’s knees and Cesar’s back starting showing signs of injury as we started up again, so Josh elected to stay back and ride a little slower with them. We chugged along for another 30 miles or so, eagerly looking for Tony’s car. Josh was the only person with the map so David, Matt, Kyle, and Luis were banking on Tony parking at our next turn. Of course Tony was leisurely driving along the hillsides of Aberdeen as they sped past the correct turn and biked for another mile and a half. Once they realized their error, they had to go back uphill to find the correct turn. We met for a quick lunch and as we were packing up Cesar presses his tire against the rim and asks the group ‘Wait is this a flat?’ After fixing his nearly completely deflated tire, we asked how long it has been flat. When he responded with ‘since this morning’, it was very apparent why he was dragging behind and straining his back. Cesar took off for the last 40 miles leading the pack and pain free. When we drew closer to the campsite, we decided that the first person to get their could drink the last of the Elysians from the night before as a reward. David Juergens proceeded to take off at speeds equivalent to Lance Armstrong during the doping era and whipped everyone to the campsite. Matt and Kyle remained at a steady leisurely pace because having banter at the back of the pack seemed better then drinking a beer with inflamed quads. We pulled into the campsite at 5 pm, leaving us with plenty of time to watch the Husky game. Our dreams were quickly crushed as we realized there was no service at the campsite but then immediately rejuvenated as our beloved driver Tony pulled 6 large Domino's Pizzas out of his car. We capped the rest of the night off by setting up hammocks and digesting our pizza in luxury. We talked, laughed, and shared our optimism for how easy we ‘thought’ the next day was going to be (we are clearly not foreshadowing anything). We started off the day with plenty of groans as we discovered just how sore our legs and back were. Mama Josh blessed us with an extra hour of sleep, which worked in no way to relieve any aches and pains. We limped around the campsite, ate some oatmeal and crunchy cowboy-coffee, packed up, and left by 10 am. Upon starting the day we were quickly greeted by mountains. 15 miles into the ride, Josh ‘accidently’ kicked his derailleur off. Tony was given the opportunity to work on his tetris skills as he maneuvered 9 peoples camping gear, food, and clothing into his little Ford Focus to make room for Josh. We often make fun of Josh’s hippy hobbies and love for organic granola but for once his slackline was useful as we used it to strap the fallen bike frame to the hood of the car. Josh was then driven to a bike shop, which somehow took 3 hours, allowing him to conveniently miss (skip) 45 miles of treacherous hills. Tony, assuming we would need his assistance while helping Josh, left food and water 30 miles from where he picked Josh up for us. Little to Tony’s knowledge, leaving only two gallons of water for the seven thirsty riders is nowhere near enough, leaving Matt and Kyle without water. After a quick sandwich, we decided to leave from our resting place in search of a town with water. Approximately 5 miles after our stop we came across a gas station and stopped in hopes of a desperate refill. Unfortunately for us, the gas station had no minimart or hose, crushing our hopes and dreams of hydration. Before taking off, we saw a car parked near the gas station and decided to ask the man inside where the next town was. We told him about our ride, our foundation, and our desperate need for water, and he pointed us in the right direction and gave us all the water bottles and gatorade he had in his car, reminding us of the true hospitality and benevolence of the people around us. Just before leaving, our fearless leader Josh was finally reunited with us. We took off from the gas station and began to pick up some speed. Around 10 minutes later, John requested a bathroom break and we all began to fear for his prostate health as he broke double digit pee breaks before 2 pm. Breaks every 5 miles for John’s dysfunctional bladder became routine for us. The final stretch of the ride was tough for all of us as fatigue began setting in. Our beloved Philanthropy Chair was dry heaving while powering up a hill, refusing to stop for a break. The only time he took a break was when he got off his bike to literally pass out on the side of the road. This shockingly may or may not have something to do with him refusing to eat all day. As we rode into the campsite David was so exhausted that he fell over trying to get off his bike in the middle of a crowd of geriatric RV owners. Falling while getting off a bike when you don’t use clip in pedals is a true feat of athleticism, congratulations David. Owing to the fact that we started late we didn’t have much time before the sun fully set but we enjoyed the beautiful view of the ocean as we looked out over the cliff. The combination of biking 97 miles and the sound of the waves crashing onto the beach put us to sleep as soon as we hopped in our tent. It’s 5 am and the alarms sounded for each of our riders as they woke up for their first day. Our very own Kyle Bransky showed up with all of his tags still attached to his helmet. He claimed he lost a bet, but we secretly assume he is doing it so he can return it after the ride to save a quick 20 bucks. We all settled in the dining room of the house to find Luis live streaming our entrance of Theta Chi. The first of many livestreams with ‘non improving’ quality. We shrug off the constant interview attempts, pack our car, prepare our bikes, and hit the road by 6:20. As the sun began to rise, we all strapped on our seven-dollar Oakley’s, fresh from the black markets of Shanghai and courtesy of ‘China’ John Sommers. We have a seamless ride to the ferry in Edmonds, WA, saying to ourselves, “Wow, those first 14 miles were easy, we can definitely all hit 89 without a sweat.” The first of many poor assumptions that day. 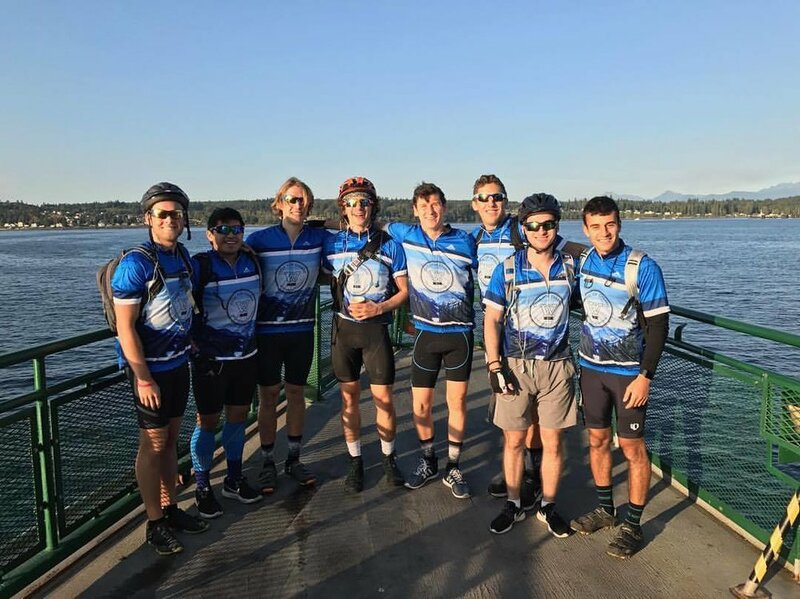 As soon as we reached Kingston, we were immediately greeted by a beautiful bridge crossing over from the Kitsap Peninsula to the Olympic Peninsula, where the views were breathtaking and symbolic of the true beginning of our journey. As our journey began, we were immediately greeted with long stretches of uphill. After grabbing a bite to eat for a quick rest, we were given entertainment by David Juergens as he danced for cars passing by – unfortunately nobody tipped. After some solid riding by the Oakley Crew, we finally find ourselves on a beautiful bike path accompanied by a lush forest. Once again, our dear Philanthropy Chair and soon to be discovered Hollywood drama actor, Luis Diaz, was reservoir dogged on the side of the path. Wincing in pain like a pre-amputation Civil war solider, our dear philanthropy chair gives a breath-taking performance sure to be Oscar- nominated this Spring. Kyle turns back and rushes to the scene ready to perform CPR. Luis shows his brutal wound of a wasp sting on his anterior earlobe. Dumbo-effect now in full swing, our philanthropy chair bravely overcomes his life-threatening injury and surges to the front the pack. After nearly falling victim to a indecisive chipmunk, Kyle boasted his ungodly athleticism and catlike reflexes as he dodges it to escape certain death at the blistering speed of 7 mph. Little did Kyle know that the true threat lied within. Kyle, approaching a sharp right turn on a narrow bike path at the base of a hill, began to question his speed and general understanding of physics. Kyle quickly remembers how incredibly he handled the chipmunk debacle, and decides to go for it. After a full send, Kyle makes the slightest of turns, realizes his unfavorable odds, as he flies into a ditch. Kyle, like a Olympic gymnast, flies over his handle bars, head first into a fence. His helmet took the brunt of the impact, rendering the Amazon return process an uphill battle. Alas, he will probably still attempt it anyway. Miraculously, Kyle arises from the ditch completely unscathed and we continue on our ride. Now that we’ve sufficiently roasted all of our riders let’s move onto the positives. Within the first few miles we already began to have positive interactions with people around us. Being able to share the story of Kyle Charvat is definitely the most rewarding part of the bike ride. Cesar quickly established his dominance as an endurance athlete by leading the pack on all uphill sprints. On most breaks when we would complain about aches and cramps, he would fill the silence with exclamations of how much fun he was having blazing through the hills. Josh once again proved his ungodly mental strength and love for cycling as he chose to take on the ride on a heavy mountain bike. For those of you who are not familiar with the struggle of road riding on a mountain bike, its like running a marathon with cement shoes. You’re an impressive specimen Josh. The ride was strikingly beautiful and is a constant reminder of how lucky we are to live in a state like Washington. The day started with an adrenaline filled city ride to Edmonds, with an abundance ofbreakfast sandwiches on the ferry crossing to Kingston. The meat of our ride then occurred over a gorgeous bike path under tree branches, with a view of the Straight of Juan de Fuca, and Mother Canada in the distance as we passed through Port Angeles. That bike trail was our saving grace after our less than perfect start. We ended the day crossing through golden wheat fields and mooing at cows as we passed. Both parties appreciated the attention. Nonetheless, the beauty of the PNDub has distracted us all from the pain we have. This is the hardest thing most of us have ever done, but we are pretty sure that at least one of us will finish the trek – even if it’s just our driver/trip dad Tony.